The lightweight and compact benefits of a money clip/card holder will make you a fan in no time! This black leatherette credit card wallet holds credit cards, license, and even a few business cards without the bulk of a full-size wallet. On the back of the wallet is a French fold money clip that holds 10 to 15 folded bills with ease! 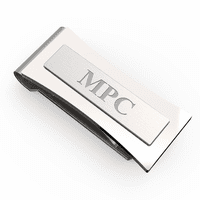 We will engrave your name or initials on the money clip for free, and will package it in a gift box. The contemporary style and affordable price make this a great gift for groomsmen, corporate associates, friends and family!. Dimensions: 3" x 2 1/2" x 1/3"
Absolutely. We can offer you 15% off the purchase price for that quantity, as well as free shipping and free personalization. You can email us at help@executivegiftshoppe.com and/or reply to this email and we can arrange for a coupon code and give you ordering instructions. Is it in a gift box? Yes, this comes packaged in a gift box. Is there a way to have a company logo engraved? Yes, we can definitely engrave a company logo for you. There is a $50 minimum order size. You can go ahead and place your order and in the comments section of our checkout page, make a note that you will be emailing us the logo for engraving. Then email the logo to help@executivegiftshoppe.com. If you have it in black and white adobe illustrator .eps format, that would be ideal. Otherwise, we'll be able to convert a black and white jpeg to engravable format if you have that. Love it ! It is as shown in the website, well packaged. I recommand it. No worries here, great work and fast shipping. I was very pleased with the money clip I received. I was impressed that it has a very nice look to it and the engraving was perfect. Very nice!! The money clip is great, perfect for what I need. The engraving came out great too. Item arrived in 3 days. I'm a happy customer!!! Just what I was looking for! Quality is great, and reasonably priced. Gave as a gift to my Father and he really likes it! Quick and easy. Great value, unbeatable price great quality. My last one lasted over seven years. So I purchased two more. ProsHolds three cards and a large amount of cash. Very easily. Use daily. ConsStitching wore out at seven plus years. Great gift, my boss loved it. This money clip is nice for the price. I should have bought two. The engraving is beautiful. Thanks for making my valentines day perfect. Ideal for travel inside front pockets and not flashy to potential pickpockets. Durable and Looks Great. Perfect gift for my husband. Great gift for the man in the family. Very nicely made and the engraving is beautiful. Bought three of these for the men in my family-loved them!! Great quality and the engraving makes it more personal and elegant. Great price, great quality, and great customer service-arrived quickly. I purchased a leather wallet money clip for each of my three young grandsons as Xmas gifts. Upon opening the shipment I was more than pleased to find the high quality design and workmanship of the product and it was apparent these were the perfect gift for them. Having their names engraved and adding a $2 bill and a plastic ID card will make them feel like real big boys. They are nice. Elegant engraving. Good product. very useful. engraving looks good. 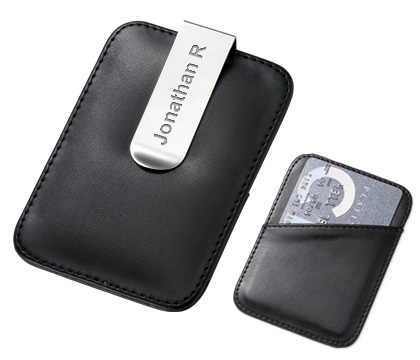 A nice product for business cards and money clip that is not too expensive, but stylish for work. More than excellent value for money!.... Very stylish and classy whether used during an important event or casual outings. Neat engraving. Site highly recommended! 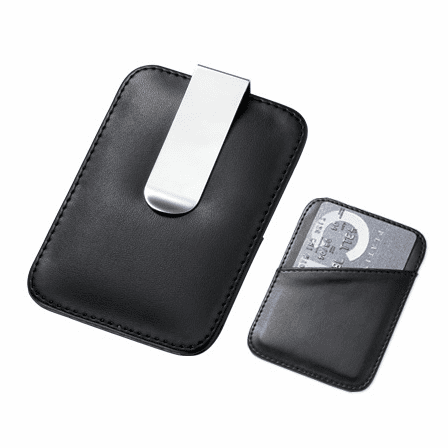 The money clip/card holder is made of the highest quality and durable for daily use. It is extremely useful - no bulky wallet! I highly recommend this product. 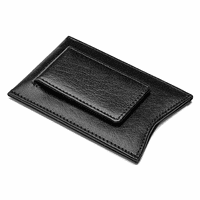 I purchased the Black Leatherette Money Clip/Card Holder to keep track of extra money without having to store it in my wallet. It has done its purpose quite well and the card slot makes it easy to travel with one or two cards along with a decent amount of cash. The only real problem I encountered was the clip bending when I sat down for too long. It can be pulled back in to shape but it is still an eye sore after it happens each time. Overall, however, this is a very acceptable clip and the card holder is a nice touch. 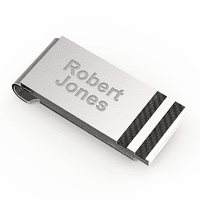 An added bonus is the engraving they allow on the clip itself - a simple but potentially valuable touch to this product. The corners of the card holder fold over after being worn several times. The money clips sharp corners are uncomfortable in the pocket.